Can you win your fantasy football league in the first round? I’ll let Dr. Evil answer that question. Can you lose your fantasy football league in the first round? Daniel Bryan, take it away. Are there ways to avoid blowing your draft in the first round? YES! YES! YES! If you want to win your league, should you just pick an NFL star based on subjective reasoning? NO CHANCE! Here are four ways to not lose your fantasy league in the first round of drafts in 2016. I know you’re still out there, first-round quarterback drafters. In my keeper league of record that is entering its 12th year, there are still teams that will use one of their keepers (and by definition in this league, a first- or 2nd-round pick) on a quarterback. Right now, Cam Newton, Aaron Rodgers, and maybe Andrew Luck and Russell Wilson will be kept. I led the fantasy football coverage for Colts.com in 2014 and 2015, and I can’t tell you how many fans asked me if they should pick Luck in the first round. I tried to tell them: NO! They either didn’t understand the difference between QB1 and a mid-to-late-round quarterback was far less than the difference between an early and late FLEX position pick...or they simply didn’t care. In this age of quarterbacks, though, drafting one in the first round is the fastest way to leaving yourself no room for error for the rest of your draft. The table above shows the strategy of a late-round quarterback coupled with a first-round RB/WR has been more successful on a FP/G basis each of the last three seasons. Your team would have scored more points on average than if you opted not to take a quarterback in the first round. Also, the above FP/G marks are for standard leagues, making it even more likely that a first-round RB/WR in PPR leagues would be even more successful, since quarterback scoring doesn’t change in either scenario. The table, however, does not take into account injuries, a popular argument against taking a running back in the first round. One might argue quarterbacks are safer selections, but in 2013 the first-round quarterback (Aaron Rodgers) missed seven games. In some leagues last year, Andrew Luck was the first quarterback selected, and he missed nine games. For the most part, injuries are unpredictable and are not a logical way to lean towards one position over another in the first round. Another rebuttal to the quarterbacks are safer argument would be to take a receiver instead of a running back in the first round, especially in 2016 when six of the eight top FLEX scorers in 2015 were wideouts, not running backs. Tight end looks like it will be extremely deep in 2016, and as of early July, Gronkowski will be without his starting quarterback for the first four games of the season due to Tom Brady’s suspension. That’s 4-of-13 weeks -- almost one-third of your fantasy regular season. There’s really no statistical way to quantify what Jimmy Garoppolo will mean to Gronk’s September value, because Brady has been Gronkowski’s quarterback for literally every game of his career. It’s not hard to imagine a drop in production with a quarterback who has never started an NFL game and thrown 31 total passes in two seasons, however. The bigger argument here is the rest of the tight end crop for 2016. What do these tables tell us? They tell us the gap between TE1 and TE6 has shrunk each of the last two seasons in standard leagues, and even more so in PPR leagues. The gap between TE1 and TE12 has also been much smaller from where it was in 2013, even though it was roughly the same from 2014 to 2015. 4for4’s 2016 projections bear this out too, predicting the deepest group of tight end options in recent memory. In PPR leagues overall, TE6 and TE12 are expected to edge even closer to TE1, making it less desirable to spend a first-round pick on Gronkowski. This makes sense, considering the difference between TE6 and TE12 with TE1 in 2015 was even smaller if measured on a FP/G basis. That’s because TE6, Tyler Eifert, missed four games and TE12, Antonio Gates, missed five games. The figures in the above table are fantasy points divided by 16 weeks. If the mid-to-late-round options repeat their FP/G output from 2015 for 14-16 games, the value of drafting Gronkowski in the first round is diminished (unless Gronk has an unprecedented season). In standard leagues, the gap between TE12 and TE1 is also projected to shrink, meaning if you pass on Gronkowski it will likely make more sense to draft a tight end late, instead of a mid-round option, like Travis Kelce or Coby Fleener. The NFL has evolved into an extremely pass-heavy league over the past couple of years and fantasy scoring has reflected that, with wide receivers reaching new heights among the fantasy elite. First-round running backs missing games at an alarming rate hasn’t hurt the cause of wide receivers either. Just look at how many wide receivers have finished in the top-10 of FLEX scoring leaders over the past few years. Nine out of 10 FLEX scoring leaders in PPR last year were wide receivers. Ninety percent! Even in standard leagues, it was 70 percent wide receiver. In PPR leagues, it’s really hard to argue against not taking one of the best wide receivers in the game in the first round if you want a pick with both a high floor and high ceiling. The devil’s advocate argument would be 2015 was an outlier. Were there more wideouts than usual in the top-10? Yes, but even going back to 2012, seven out of 10 FLEX leaders were still receivers. I’d say that’s a bona fide trend after four seasons. Can the same be said about picking a receiver in the first round of standard leagues? Let’s look at the ADP of those top-10 FLEX scoring receivers from 2012-2015. What does this tell us? Since 2012, 75 percent (8-of-12) of the first three wide receivers selected in fantasy drafts finished among the top-10 FLEX scoring leaders, including 83% (5-of-6) over the past two seasons. The first wide receiver selected in drafts also finished among top-10 FLEX scorers in 2012, 2013, and 2015, with lone exception being an injured Calvin Johnson in 2014. So when you see so many wide receivers being drafted in the first round of 2016 drafts, just remember it’s the public catching up to what has been a four-year trend, not just a reaction to last season’s wide receiver riches. This final section will be a matter of personal opinion. Towards the end of first rounds in 2016, drafters will likely find themselves looking at a draft board where Antonio Brown, Julio Jones, Odell Beckham Jr., and DeAndre Hopkins have already been taken. In this scenario, I can see justifying making sure you get the RB you want and taking the best available WR in the 2nd round, if that running back comes with less risk. Again, this is a matter of personal opinion, but these are the running backs I would target in this case, with the thought of taking receivers like Dez Bryant, Allen Robinson or Alshon Jeffery in the 2nd round. DISCLAIMER: I will not be going RB-RB in any of my 2016 drafts. First of all, Miller hasn’t missed a game in three consecutive seasons (knock on wood). I see no difference in taking Miller in the first round and a receiver in the 2nd round versus vice versa, except you risk not getting Miller in the 2nd round. Our rankings have him pegged as a top-four running back in 2016, and I agree. The potential is enormous moving from Miami to Houston. In 2015, Miller was RB6 in standard and RB5 in PPR despite ranking 18th in rushing attempts. The Texans, meanwhile, were fifth in rushing attempts in 2015 and first in 2014 under head coach Bill O’Brien. It’s Adrian Peterson. I could stop the argument right there, but I’ll go on. He’s missed just two games due to injury since 2012. The age argument rings shallow with him, considering he almost had a redshirt season sitting out 15 games when healthy in 2014. Stacked up against the other mid-to-late first-round running back options, Peterson’s floor is much higher. Todd Gurley’s Rams offense is suspect, David Johnson has a half-year sample size as a bell cow back (see Jeremy Hill in 2015), Ezekiel Elliott landed in the perfect place in Dallas but still hasn’t played a single down in the NFL, and Jamaal Charles is coming off a second torn ACL and turns 30 in December. I can envision ways those first-round picks don’t work out much easier than I can for Peterson. Plus, Peterson has a high-ceiling handcuff in Jerrick McKinnon, who is easy to snag a round or two early from his 15th-round ADP in 12-team leagues. Don’t get me wrong. I think Elliott’s ceiling is extremely high in Dallas, but if this exercise is about finding a safe first-round option, I would give the edge to future Hall of Famer Peterson. Put your quarterback rankings in a safe only a trusted friend has the combination to, and that friend can access them for you at some undetermined point after the first round of your draft is complete. Once that is taken care of, know that tight ends are shrinking the gap to Gronkowski and decide on a plan between RB and WR, severely limiting your RB options based on those with a high floor. 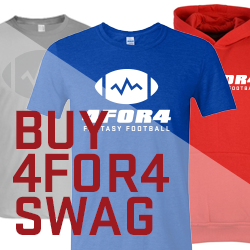 Editor's Note: Dominate Your League with 4for4's Premium and DFS Subscriptions. Sign up here! PPR Winners & Losers: Which Players are Helped and Hurt by PPR?